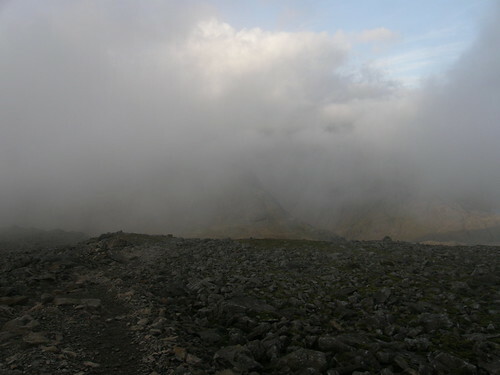 High winds and heavy rain, on top of a slight hangover, didn’t make for a promising start at the Wasdale Head. By the time we started walking however, things seemed to be improving – the wind seemed less violent than the forecast had suggested and the rain had slowed to not much more than a steady drizzle. 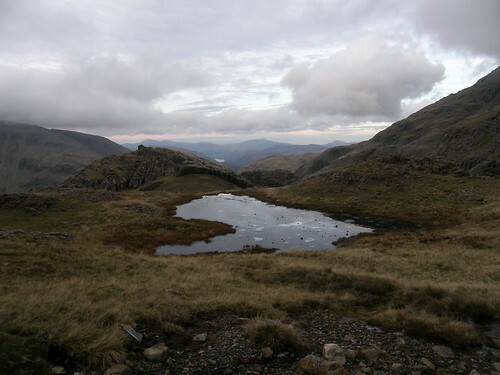 Sadly, appearances can be deceptive: by the time we had climbed to Styhead Tarn we were being buffeted by strong gusts and the wind driven rain was finding its way into every nook and cranny. We abandoned any idea of ambitious peak bagging exploits and instead opted to drop down Taylorgill and then to follow the river Derwent down the valley toward Keswick. 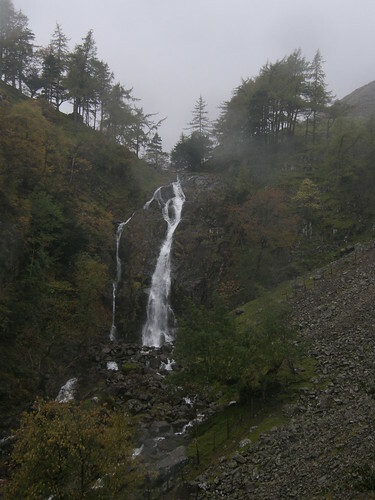 We both expected to find a tea-shop at Seathwaite, but the disappointment of being wrong about that was tempered by the relative shelter of the valley and a slackening of the rain. In fact the walking by the river and the accompanying autumn colour was quite pleasant. At Grange there are several tea-shops and after a welcome hot drink in one of them we caught the an open-topped double-decker bus back to Keswick. Back at CJ’s I changed for the drive home. 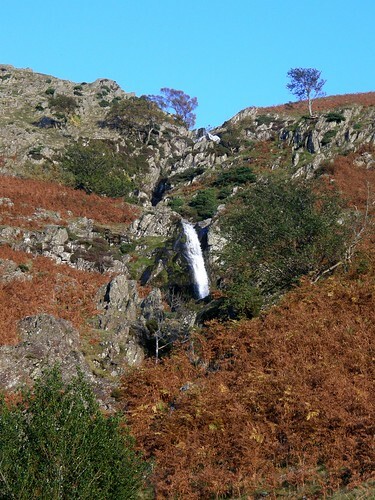 My new boots had leaked, but then everything had leaked: my coat, my over-trousers and most spectacularly my rucksack The outer ‘waterproof’ cover of the latter had collected quite a pool in its base which must have made a leak into the main body of the sack inevitable. Ho-hum. Never-the-less, a marvellous two day trip which hopefully will be the first of many. 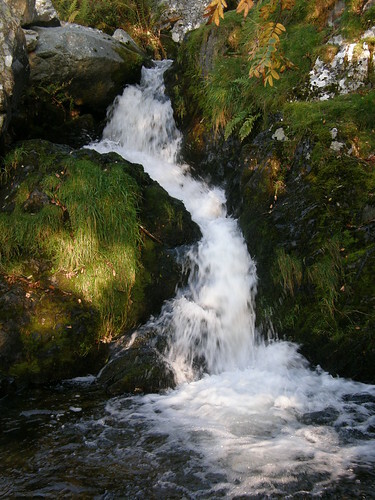 Borrowdale. Castle Crag poking its head from the trees on the left. Skiddaw in the distance. 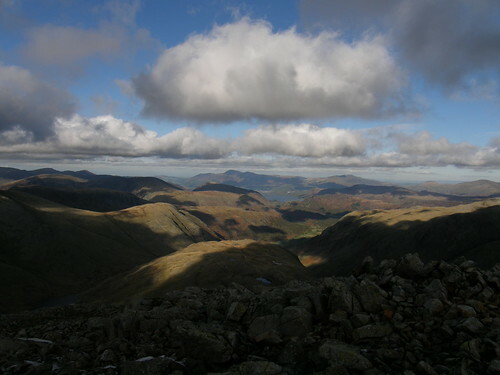 King’s How on Grange Fell prominent in the centre. I had slept on CJ’s sofa in Keswick, chiefly so that we could make an early start: in which aim we were partly thwarted by the bus timetable. 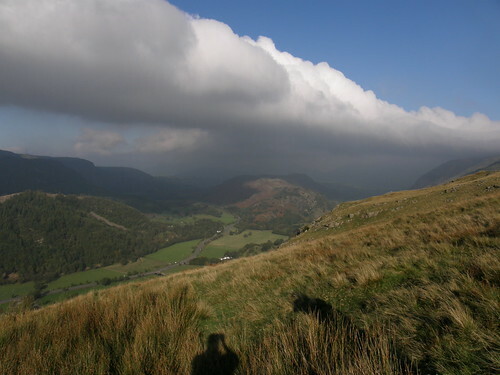 The 9.25 from Keswick left us at Mountain View near to Seatoller in Borrowdale. 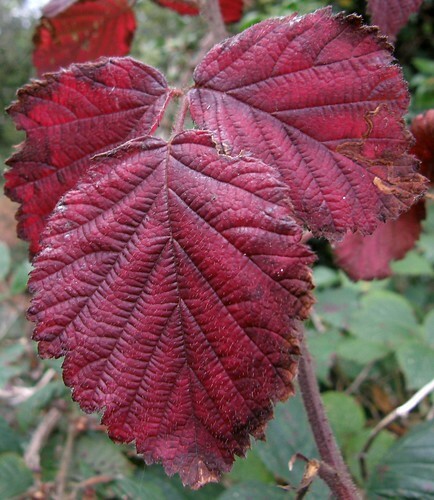 Even at ten to ten the air was still cold and sharp and in the late autumn shadows the frost was lingering. 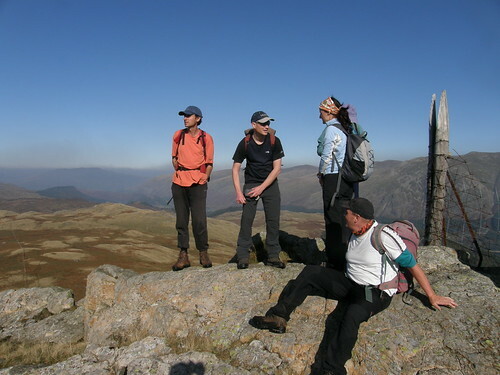 Our climb was steady and the clear skies encouraged regular stops to look back and admire the view. 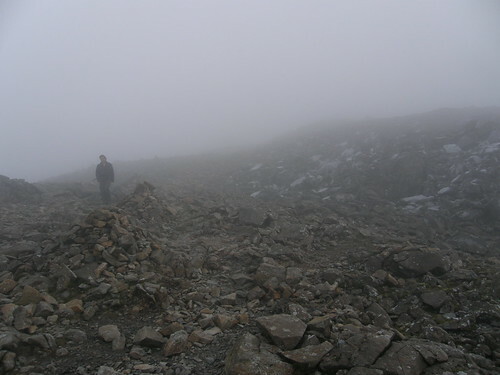 Thornythwaite Fell, the first Birkett of the day, passed by unnoticed (several cairns but no real summit). CJ would tick off his hundredth Wainwright in the course of the day’s walk, but humoured me and consented to frequent diversions to minor knolls to assuage my growing obsession with Birkett bagging. 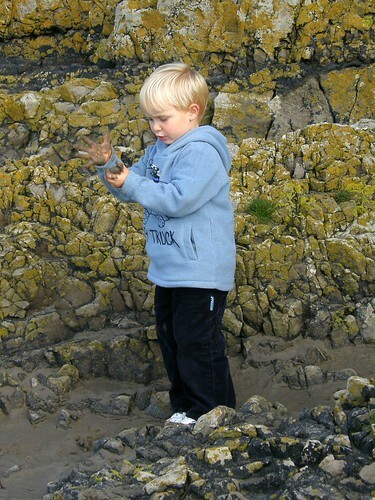 The first such diversion was to Combe Head, which was actually well worth the extra effort. The same view from Combe Head. Beyond Skiddaw we could see the hills of Galloway across the Solway Firth. The sun was pleasant but the wind was bitter and so this stop was short and sweet, which would become standard for the day. 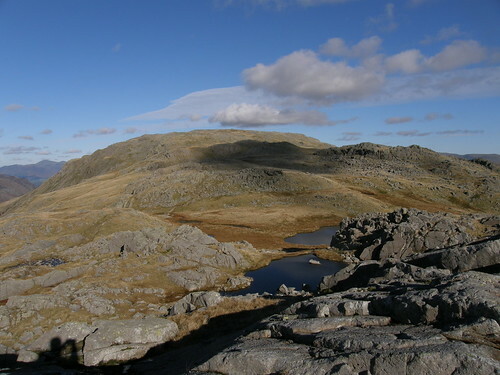 The ridge from Glaramara to Allen Crags yielded a total of five Birketts, the middle three of which were pretty non-descript. 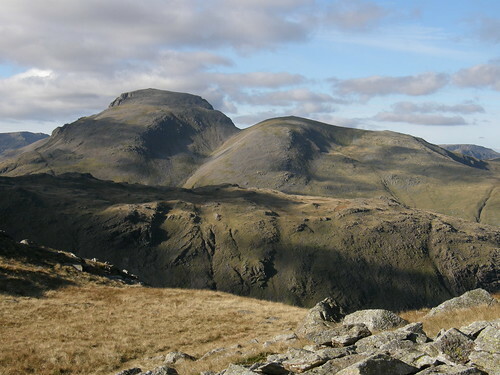 Great Gable and Green Gable. 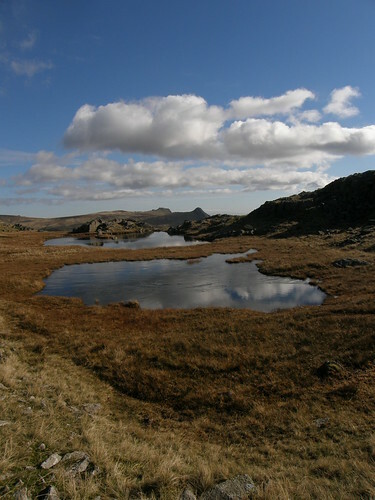 Langdale Pikes seen over Lingcomb tarns. 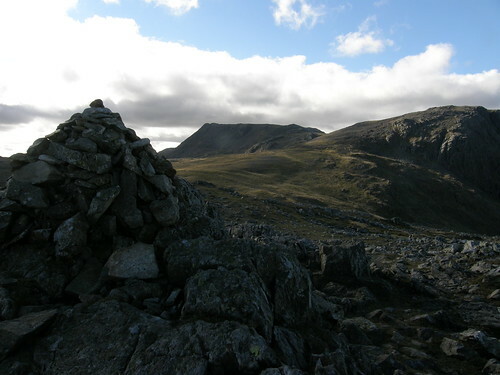 Allen Crags summit cairn. Ill Crag and Great End behind. 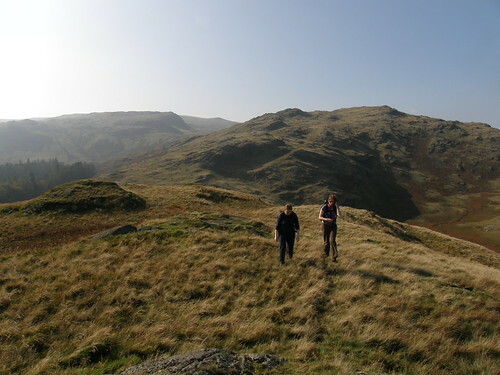 Langdale Pikes. 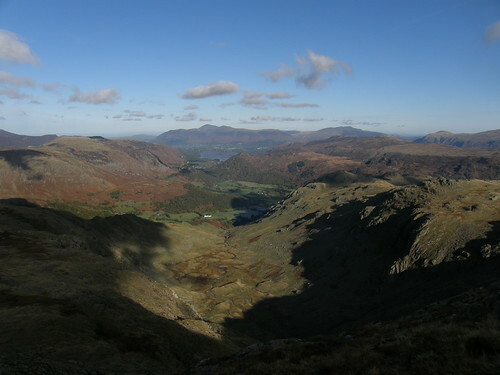 Lingmoor. 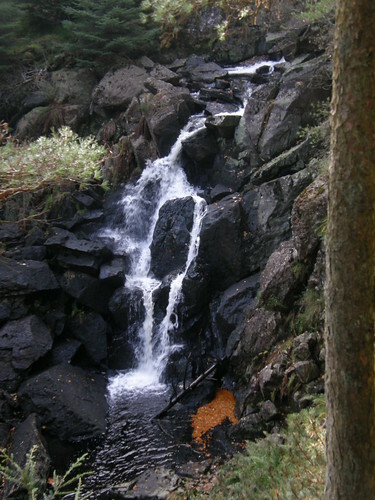 Pike o’Blisco. 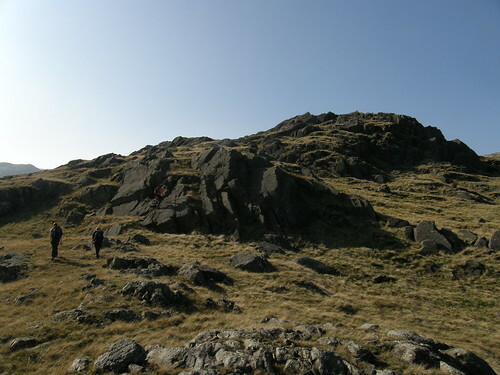 Coniston Old Man (?). 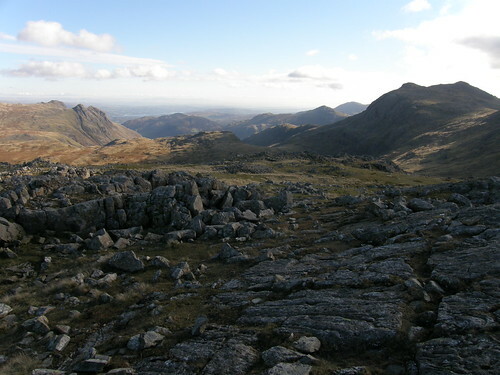 Bowfell. 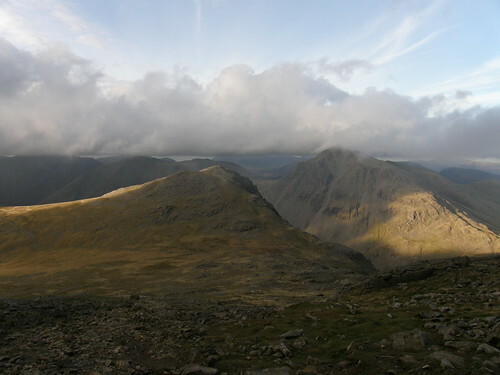 Ill Crag, Broad Crag and Scafell Pike from Great End. 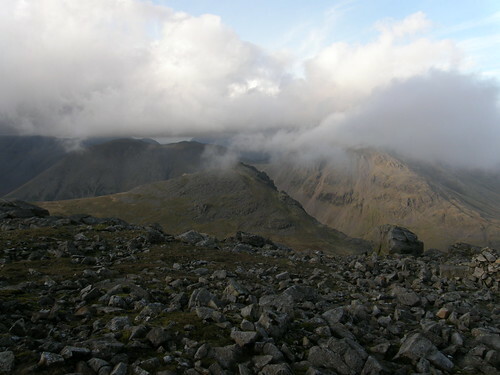 Scafell Pike and Broad Crag from Ill Crag. 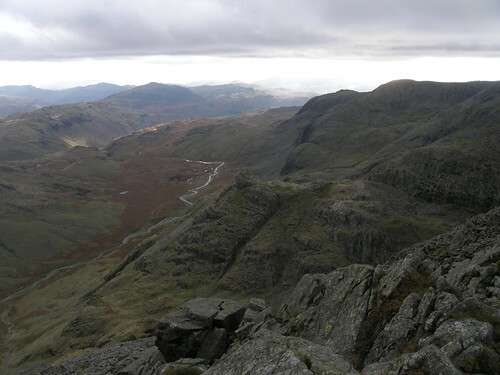 Upper Eskdale from Ill Crag. 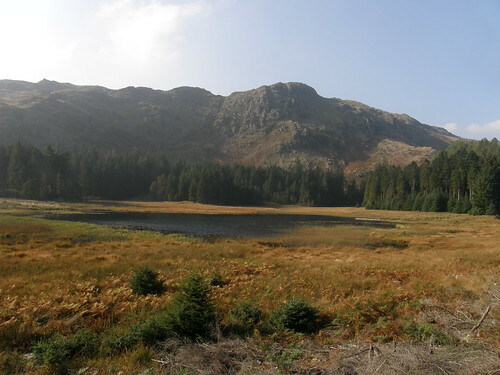 Harter Fell prominent in the background. The airy knobble in the centre which looks to be a perfect site for an Inca ruin or somesuch is, I think, Pen – a Birkett. …the cloud dropped. 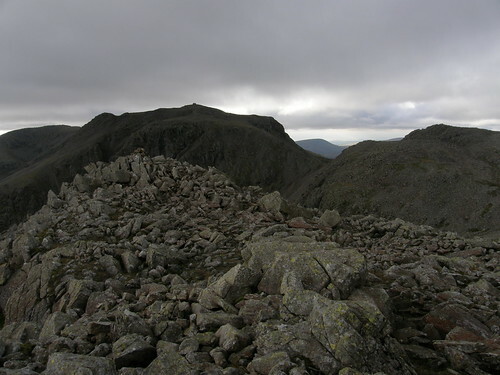 It’s 10 years since I last climbed Scafell Pike – I can date it easily because I proposed to TBH whilst we were there. 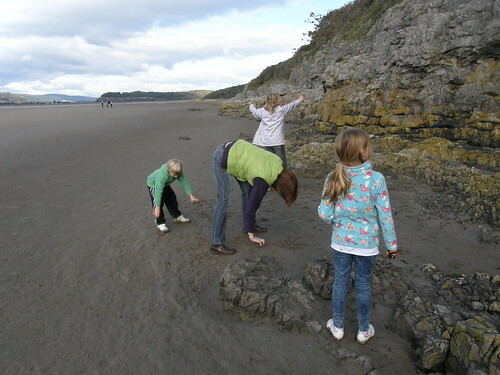 Before that I climbed it with my Mum and Dad and my brother to celebrate my Dad’s sixtieth birthday. 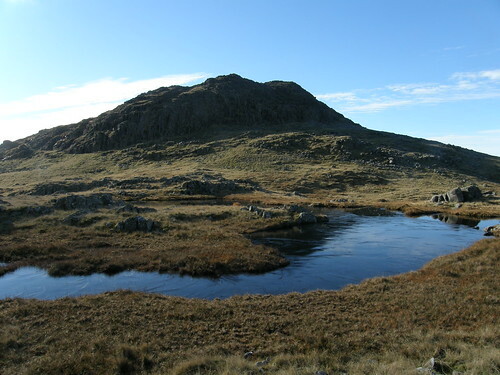 Many years ago I climbed it on a glorious day after a high camp on the slopes of Pike O’ Blisco. I’ve seen the view before – but it was still frustrating to miss it when the weather had been so fine. 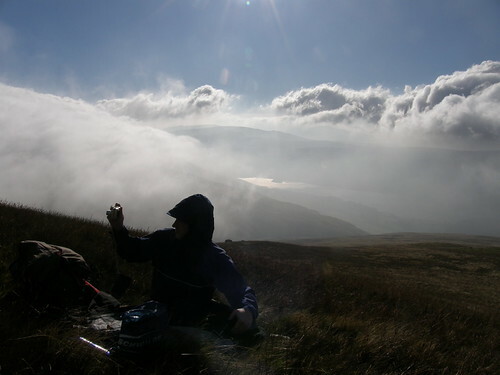 We followed a bearing from the top – I surprised myself by being quite anxious about my own navigation. Coming down – note the heavy frost still in the late afternoon. Elsewhere there were large icicles. We were bang on course. 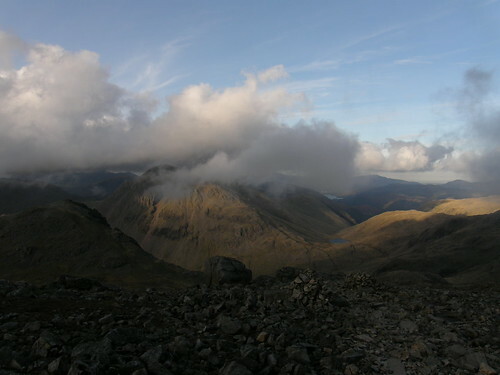 The cloud continued to clear and most peaks reappeared, although I’m not sure that Scafell Pike ever completely cleared. Tiredness was definitely beginning to take hold, but CJ found an energy store for a burst of speed as we climbed Lingmell, a twelfth Birkett and fifth Wainwright of the day. I judged that we had enough light to get us through the complex terrain of the Corridor Route so we set off that way. 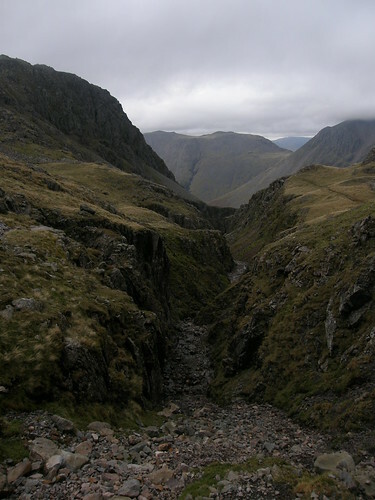 The top of Piers Gill. A (frozen) Corridor Route tarn. We finally arrived at the Wasdale Head Inn shortly after seven and quite some time after dark. In Will Ritson’s bar there were six different real ales on offer – so after our marathon session on the hills would we have the stamina for a marathon session on the ale? Another Thursday afternoon walk home from Carnforth. 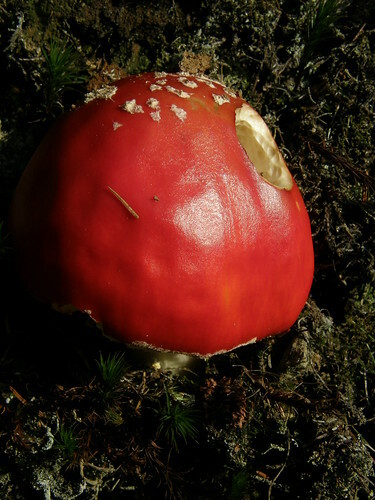 The weather was duller then it has been – overcast. 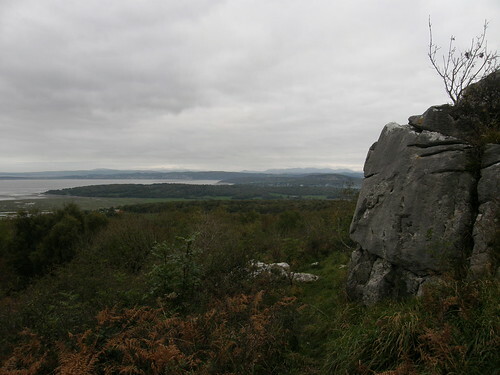 On the limestone edge that rises towards the top of Warton Crag I had a great view of a green woodpecker – at first at very close range on the ground just ahead of me, and then for some time in a tree top below me. Sadly none of the many photos I took are of any value, but I enjoyed the experience none the less. Distant Lakeland Fells from near the top of Warton Crag. 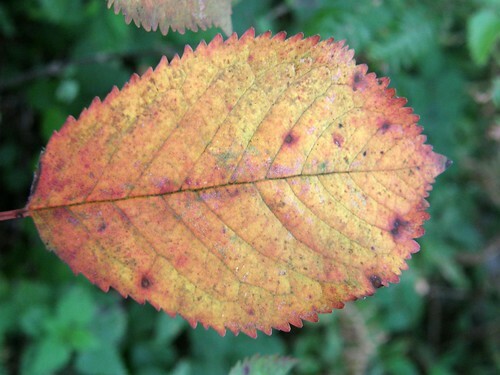 The Autumn colour compensated for the lack of brightness in the sky. 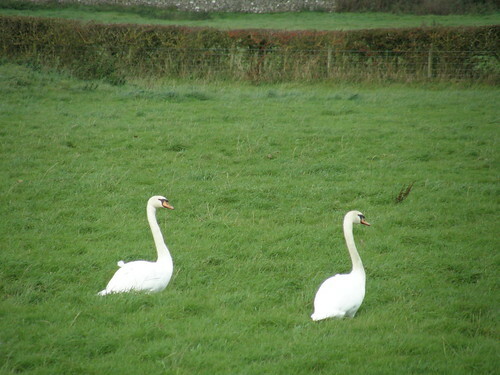 From Quaker’s Stang I watched a pair of swans feeding in a field. They moved their heads in a very curious way. TBH enjoying the autumn colour and sunshine. 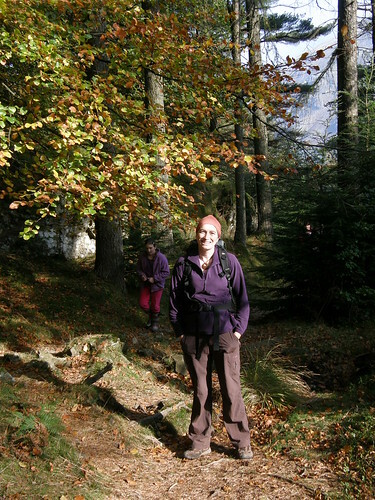 The second of our Thirlmere weekend days began with a climb through a plantation with enough space and beech trees between the conifers to still be pleasant. The path followed Dobgill, where – at the bottom of a waterfall – floating beech leaves provided a spot of colour reminiscent of some of Andy Goldsworthy’s art. 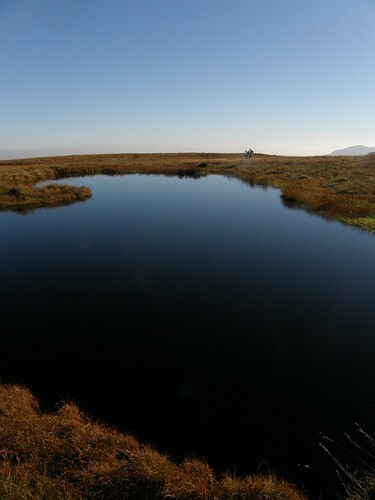 Harrop Tarn with Tarn Crag behind. 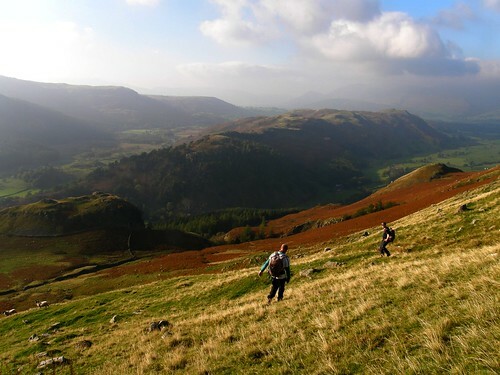 Once above the woodland the Birkett obsessive in the party (our own correspondent) persuaded most of the others to make a major detour to tick off Brown Rigg. 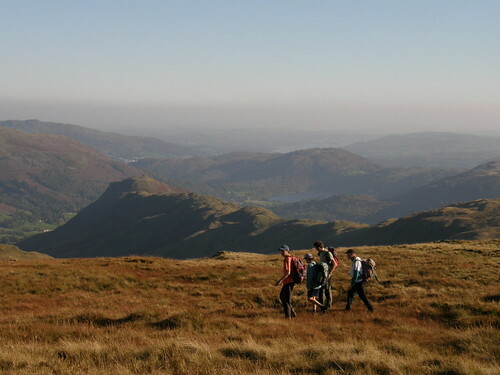 Approaching Brown Rigg with Blea Tarn Fell behind and Standing Crag in the distance. 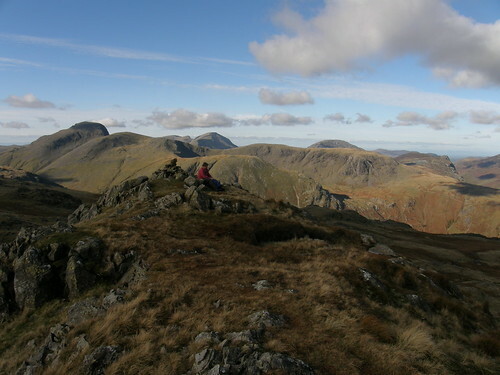 The consensus of opinion seemed to be that Brown Rigg was an excellent view point and worth the effort. 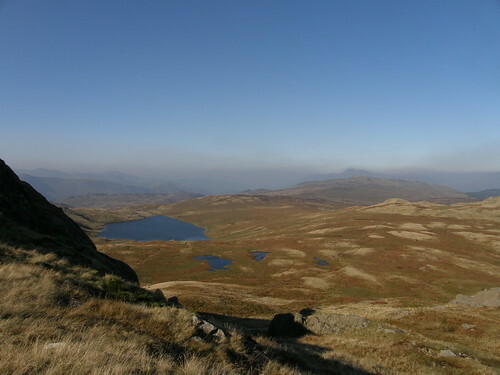 Summit of Blea Tarn Fell. On Blea Tarn Fell we rejoined the small break away group who were not so enamoured with Birkett bagging. An extended lunch, snooze, sunbathe stop ensued. 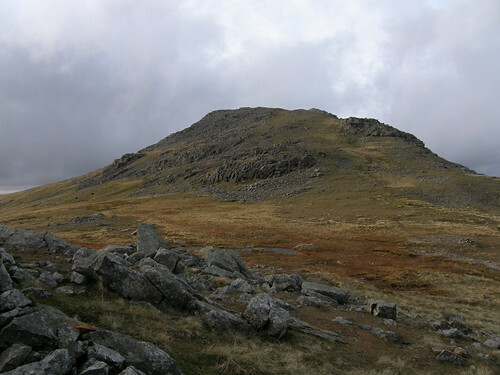 There was much debate as to whether my (well Birkett’s) proposed route via Standing Crag and Coldbarrow Fell was ‘elegant’ but after much vacillating we all ended up on Standing Crag. We lost a couple of the party here as they decided to head down for the long drive back to the 1950’s (otherwise known as Berwick-on-Tweed). 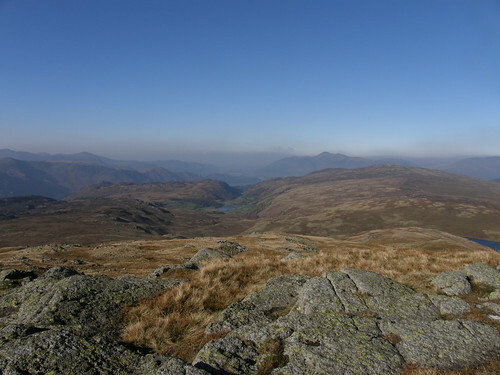 As the day drew on the haze was beginning to clear a little and Low Shoulder on Coldbarrow Fell proved to be an excellent viewpoint from which to enjoy the increasing clarity – another Birkett well worth a detour. 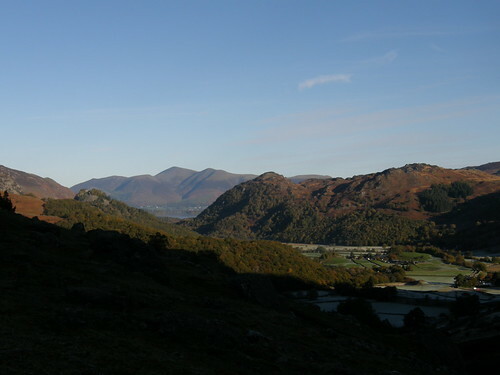 Watendlath and Skiddaw from Low Shoulder. 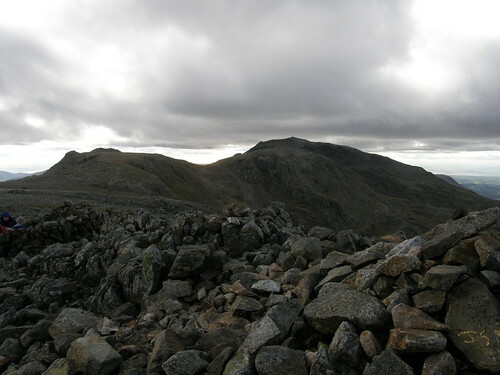 High Shoulder was the only disappointing Birkett of the day – a rather insignificant little knoll. 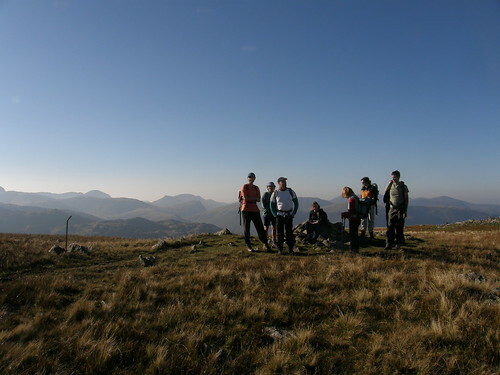 Ullscarf followed, the highest point of the day and although the top is vast and featureless, being very central in the Lakes, Ullscarf does have great views. 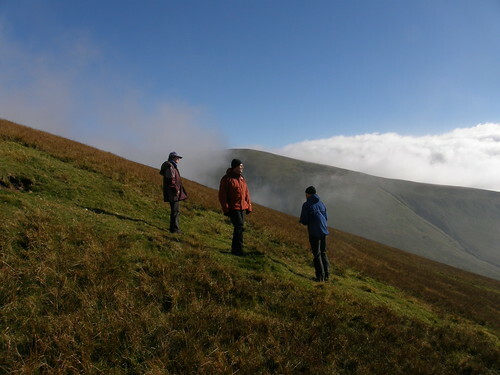 The top which Birkett calls Wythburn Fell looks to be a rather arbitrary choice on the map – one knoll amongst many, but on the ground it made perfect sense – a shapely little top with a great view. 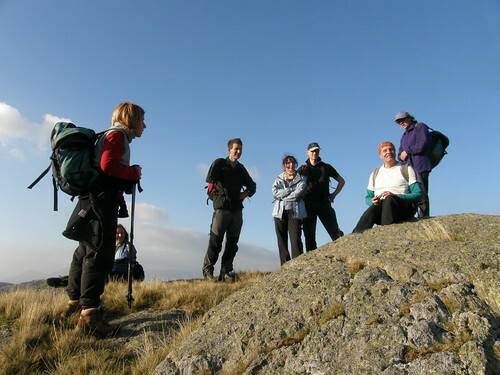 The usual suspects on Wythburn Fell. When we arrived back at the cars , MM – who was carrying some form of GPS – told me that of 7 hours on the route (Birkett suggests 4 hours) we had spent 3 hours and 26 minutes walking and 3 hours and 29 minutes sitting around. It has been noted before that when I walk with this particular group of old friends we tend do do as much sitting as walking, but it’s nice to have some empirical evidence of our collective slothfulness. Why is 6 frightened of 7? – Because 7 8 9! 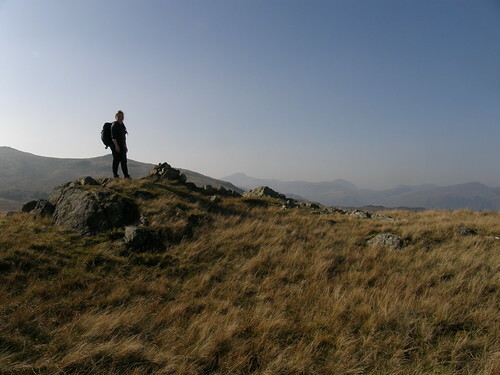 Which is the best kind of hill weather – clear skies and consistent sunshine, or wild winds and poor visibility which eventually clear to give dramatic views? We had one of each this weekend and I’m still debating with myself about which I enjoyed the most. The occasion was an annual get together with old friends in the Lakes – this time at the King’s Head at Thirlspot in the Thirlmere valley. Saturday started promisingly with sunshine, although the hotel windows had been shaken all night by strong winds. 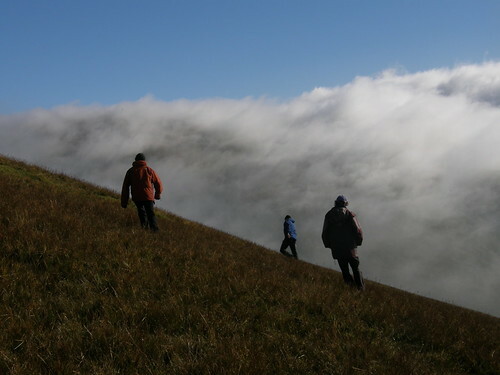 We started our ascent of the hillside behind the pub in strong sunshine but to the north Skiddaw and Blencathra had disappeared in a band of cloud and as we climbed cloud seemed to blow up and over the hills around us giving each a close fitting white cloak. 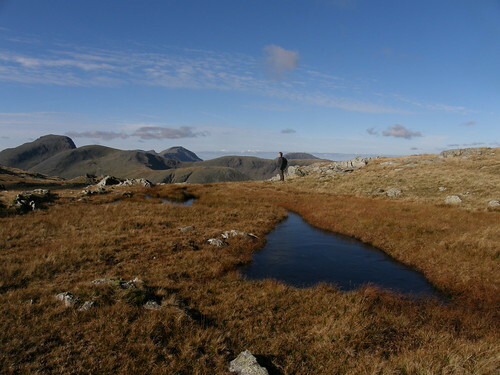 Great How and Naddle Fell, Siddaw and Blencathra missing in the background. 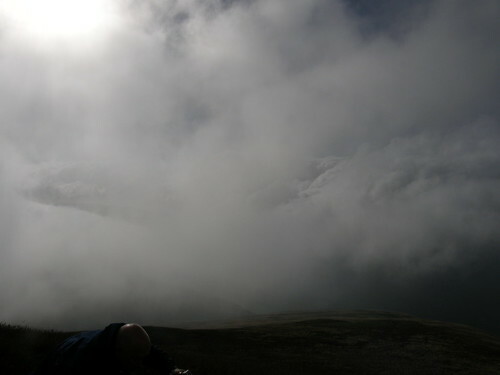 By the time we reached the first (minor) summit of the day at Brown Crag we were just below the cloud, in fact it felt almost as if a raised hand might be swallowed up and disappear from view. 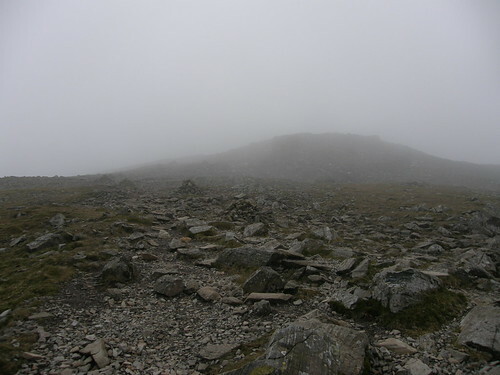 Once in the cloud we missed a turn which took the path around the flank of Whiteside and continued directly towards its summit, eventually following a bearing when the path became a little intermittent. It was now very windy and I think that we were all reassessing our ambitions for the day. 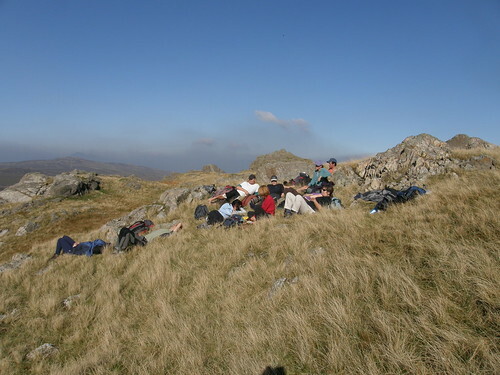 On the summit of Whiteside we huddled together to make ourselves heard over the wind and decided to leave Helvellyn for another time. Instead we turned north to go over Raise to the top of the Sticks Pass. 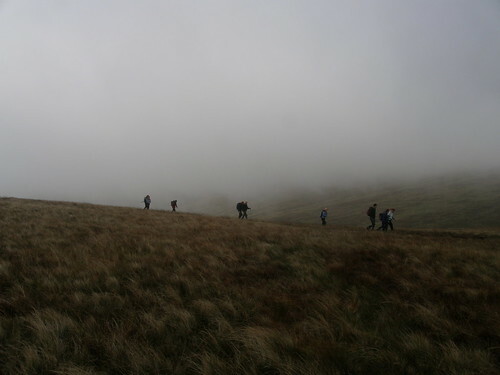 There some of the party opted to drop back towards the pub to escape from the fierce wind and the very wetting mist. 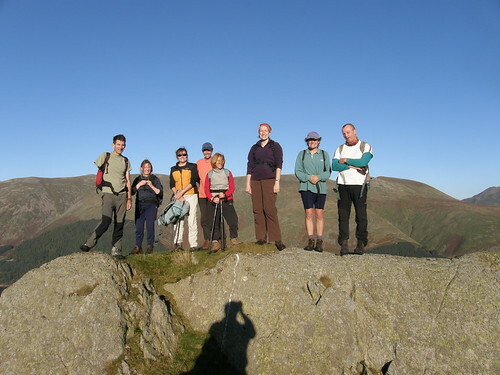 Most of us continued however, climbing Stybarrow Dodd and on to Watson’s Dodd. I was enjoying myself immensely, rather revelling in the adverse conditions (it would have been different if it had been raining too!). 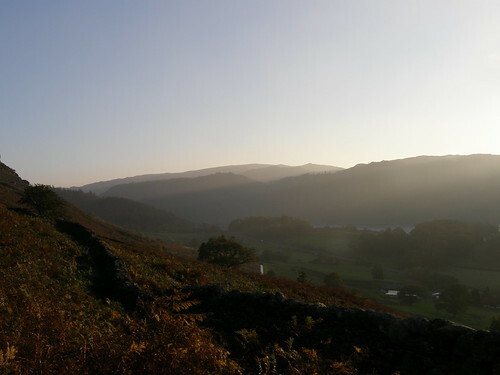 Watson’s Dodd has a spot height of 789m – hence the post title and the puny joke at the outset. Descending from there we were surprised to find that after a small loss of height, the unpromising open fellside was surprisingly sheltered. 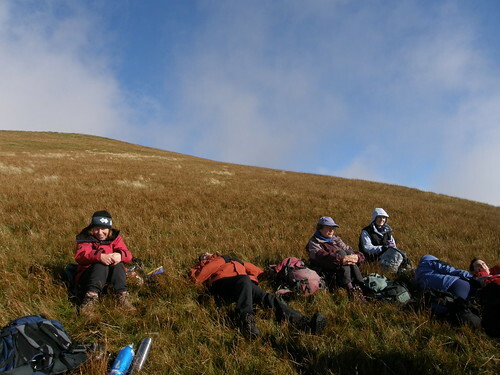 This being a first opportunity for a comfortable lunch and tea-break we stopped to take advantage. 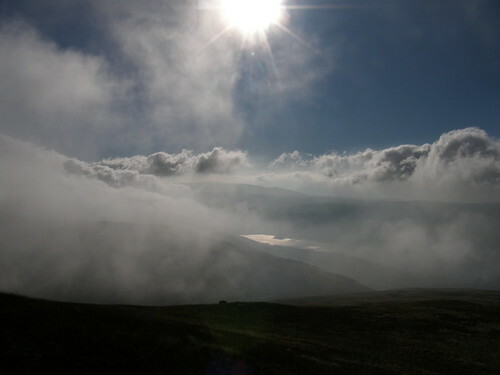 On the ridge between Stybarrow Dodd and Watson’s Dodd it had increasingly felt as if the sun were on the point of breaking through the mist and we had briefly seen short-lived patches of blue sky through rents in the clouds. 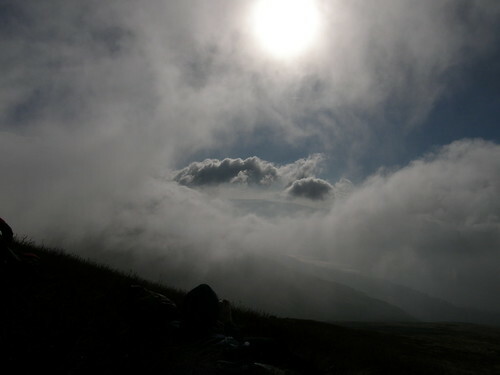 Now gaps began to appear revealing views – at first of the sunlight cloudscape opposite above the far side of the valley. 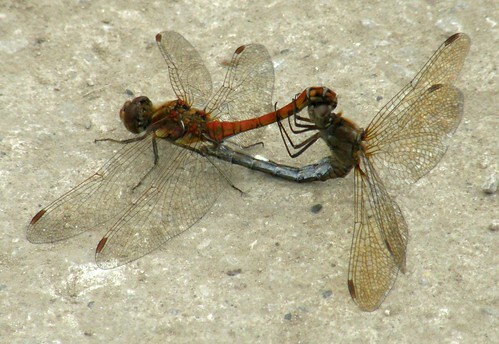 The glimpses were tantalising and it was hard to be quick enough to catch them with the camera. 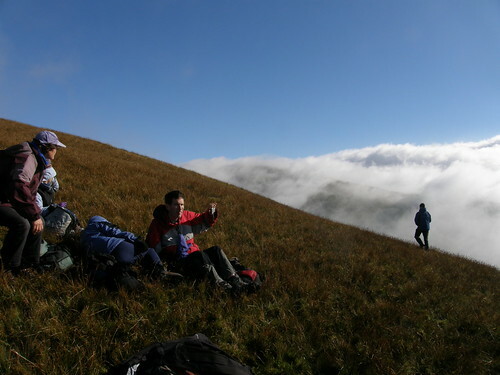 We stayed for over an hour, enjoying the sun’s warmth, admiring the enfolding views and watching the clouds and their shadows scudding by at an impressive speed. Eventually we moved on and headed down towards Castle Rock. Castle Rock bottom left, Naddle Fell in the centre. 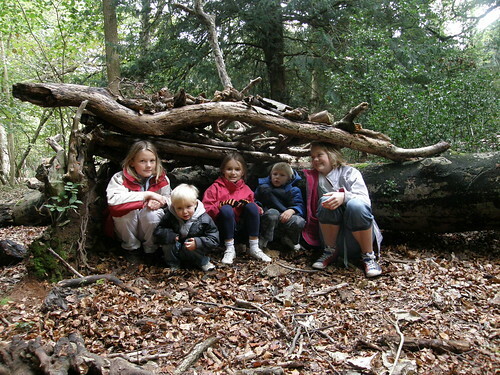 Which was the last Birkett of the day.